With the aid of a Vectormaster, you may quickly determine a course that will put maximum distance between your vessel and an oncoming storm, given the position of a storm and direction and speed of its advance. 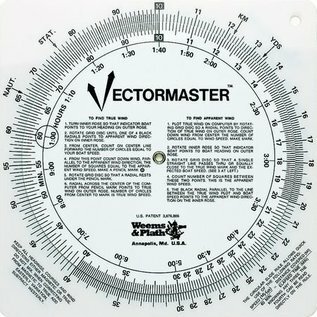 This circular slide rule can be used to determine the solution of time, speed and distance, and fuel consumption. It can also be used for conversions, multiplication, and division. 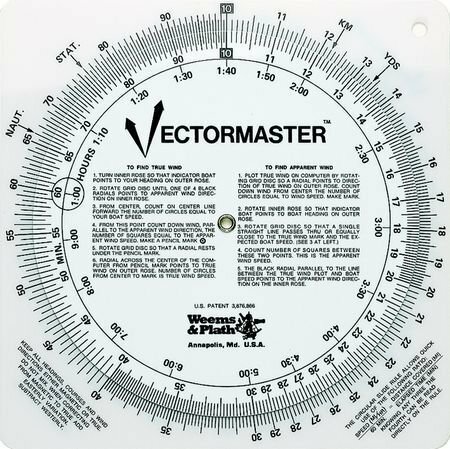 Turning the dial on the face of the Vectormaster permits rapid solution of problems involving vectors, such as those encountered in current sailing, determination of true wind direction and force, and apparent wind to be expected on other headings.